I've recently come into a a large group of dry glass plate negatives, and this is one of the first images I've come across. Most of the the other slides I've seen, so far, are likely from the early 1920's. Any information would be appreciated, I'd like to track the family down if I can! The chevrons on the soldiers left sleeve indicate time in service, as discussed here, with one chevron awarded for each 6 month period. 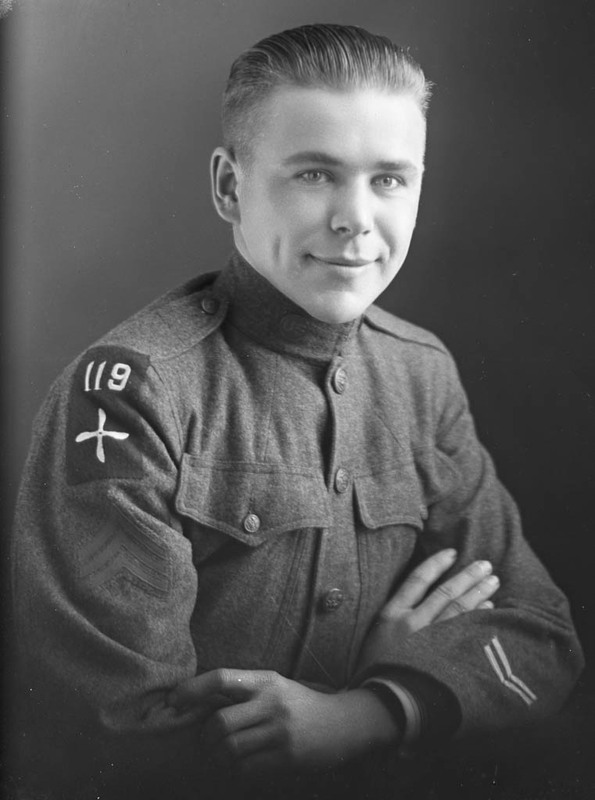 The rank insignia on the right shoulder below the patch would indicate a sergeant. This is my grandfather! I cannot believe this. I was just researching the 119th Air Service Squadron and this came up in the image results. I have goosebumps as I write this. I have a print of this photo but in the print form I have there is vignetting where as this has so much more detail. I have all his paperwork from his service. Fortunately, he never saw combat and was honorably discharged in January, 1919. Please let me know if you still have this negative. I would be happy to provide any conformation on my end that this is my grandfather. Not the answer you're looking for? Browse other questions tagged military identification uniform or ask your own question.